We can help. 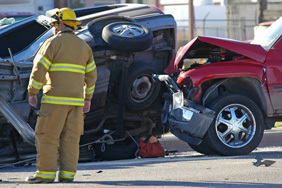 Our Santa Cruz personal injury law firm is experienced and successful in auto accident legal cases. $5,000,000 settlement for an 18 year old who was rendered a quadriplegic as a result of the negligence of a teenage driver who had been served alcohol at a restaurant. The legal team at Cartwright, Scruggs, Fulton and Walther has successfully resolved thousands of personal injury and wrongful death claims involving automobile, big truck, motorcycle, and bike accidents, obtaining millions of dollars in compensation for our clients. We are Santa Cruz County’s largest and most experienced personal injury law firm, and will work with you to insure that you are fully and fairly compensated for your loss, including medical care, lost wages, and pain and suffering. Much of the information there will answer many of the questions you may have about your automobile accident. In particular, the information regarding what to do following an accident, preserving evidence, seeing a physician, taking photographs, preserving your wrecked vehicle, the time within which to take legal action, whether to speak with insurance company investigators, and hiring a lawyer. When law enforcement investigates a car crash, they attempt to obtain the names of witnesses, as well as witness statements. However, the law enforcement personnel are also obviously involved in traffic control, caring for injured citizens, and a myriad of other problems at an accident scene. Consequently, if you or a family member have any possible names of witnesses who saw the accident, it is important that you confirm and preserve that information. It could be valuable to proving who was at fault for the injuries which occurred. It is crucial to take photographs of all aspects of the accident as soon as possible. If you hire an experienced attorney quickly, he or she will have investigators who can perform this function. The accident scene should be photographed. There may be debris around the accident scene which will be significant in proving precisely how the accident happened. Skid marks on the roadway or other markings often disappear within days. There are sometimes visual obstructions, such as trees, signs, buildings or other vehicles which contributed to the accident. It is important to photograph “site distance” from the various approaches that each of the vehicles took to where the accident actually occurred. Sometimes the design of the road itself can be a contributing factor, or repairs which are being made to the road may be a cause of the accident. In this same way, traffic signal devices are important to document. All of the above aspects of the accident scene should be visually recorded by 35mm, digital photography, and/or videotape. The vehicles involved in the car crash are perhaps the most significant evidence in any automobile accident. Good quality photographs of every angle and aspect of all vehicles involved in the collision should be taken. In order to accurately reconstruct an accident, a physicist or accident reconstruction would document or photograph certain parts of a car or truck which a lay person would not think to record. Again, if there is a significant question about who caused an accident, it is important to contact an experienced attorney who has access to these type of litigation experts. When there are significant injuries or wrongful death, your own automobile may become the most important evidence in the case. Do not lose possession of your vehicle! Badly damaged vehicles are usually towed and kept in storage yards. Insurance companies will often try to offer you the salvage value of your car, and then destroy the vehicle. In a serious case, it may not only be important to photograph your own vehicle extensively, but also keep the vehicle as evidence. If a defect in the design or manufacture of your vehicle was a cause of injury, then the vehicle must be preserved as evidence in order to prove a products liability action. Cases involving vehicle explosion, tire blowout, vehicle instability, rollover, roof crush and failure of restraint systems are all examples of product liability cases in which the vehicle itself is a crucial piece of evidence which should be preserved. Remember, you own your vehicle. Even when there are towing or storage charges which may have accrued during hospitalization, it is important to obtain the damaged vehicle and have it stored and preserved. An insurance investigator for the individuals who caused your accident will almost always call you to take a statement. Do not speak to them! The information which a trained insurance company claims investigator obtains from you can only hurt your case. The American Tort System is an adversarial process, and insurance company claims employees are in the business of obtaining information from you which they can later use against you to defeat or minimize your claims for damages. Oftentimes, insurance companies will want to obtain a “release” so that they may get your medical, employment or other information about you. Do not sign such a release. Again, it can only be used to obtain information, much of it which is private and unrelated to any claim you might make, which will then be used against you to defeat or minimize any legitimate claim you may make.